There's strawberries in our fresh fruit boxes, so it must be Wimbledon time! The world’s oldest and most prestigious tennis tournament starts today in south-west London, Wimbledon; or to give it its official title, The Championships, Wimbledon. Apart from tennis, the tournament is also known for strawberries, and they’re now included in our fresh fruit boxes, and to celebrate Wimbledon we’re giving away a free punnet of strawberries with every new fruit box ordered in July. No one is entirely certain why Wimbledon and strawberries go hand in hand but according to Johnny Perkins, the All England Club's head of PR: "It was probably two things; strawberries were in season at the time the tournament was played, and in Victorian England they had become a fashionable thing to eat." However, strawberries are not actually fruits as their seeds are on the outside. The scientific name for them is fragaria ananassa and there are more than 10 species that differ in flavour, size and texture. On average there are 200 seeds per fruit and they are actually a member of the rose family. They’re a great source of vitamins C and K as well as providing a good dose of fibre, folic acid, manganese and potassium. They also contain significant amounts of phytonutrients and flavanoids which makes strawberries bright red. Wimbledon is the largest single annual sporting catering operation in Europe and employs 2,200 staff! 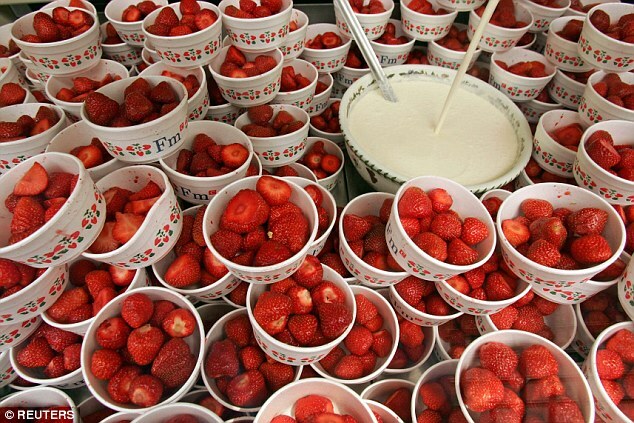 This year they’ll be serving up 28,000kg (that’s 140,000 servings) of strawberries!